SALAR KAMANGAR, Google's ninth employee, is vice president of Google's web applications, including Gmail, Talk, Calendar, Reader, Orkut, Blogger, Picasa, Video, Docs, Spreadsheets, Presentations and Checkout. 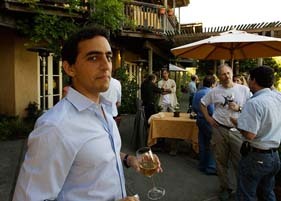 Salar joined Google in 1999. During his first year, he created the company's first business plan and was responsible for its legal and finance functions. From there, became a founding member of Google's product team, where he worked on consumer projects including the acquisition of DejaNews and the subsequent launch of Google Groups. In 2001, Salar led a small engineering team to define and launch the AdWords product in order to monetize the company's growing search traffic. Later, AdWords served as the foundation for Google's syndication on partner sites, including AOL, and today serves as the engine that drives Google's advertising revenue. Salar earned his B.S. in Biological Sciences with Honors from Stanford University.